An eBook is an electronic format of a book. It is digital in nature. It can be read on your PC, Laptop, Tablet, Smartphone or eBook reading devices like Kindle Fire, Nooks and Sony Reader, with an eBook reading software or Apps install on it. As technology and Computer devices grow, there was a shifting from old conventional printed book to an electronic book format. In this book, I assume you are a Writer or an Author or eContent Developer, who wants to publish his or her books in an eBook form. 1. It is cheaper to publish an eBook than to publish a physical book with the old traditional Publishing System. 2. It is easy to distribute. There is no need for bookshelf, racks and big wide room to keep them. No load whatsoever. It is sent digitally to buyers within seconds. 3. Easy duplication. Makes it once and make a million copies of it in minutes or seconds. In traditional Book Publishing system, you know what it means to produce 100,000 copies of your book. Digital eBook publishing solves that problem in seconds. 4. It doesn’t occupy space. A single USB Flash Drive of 8GB can hold 500 eBooks with ease. So you can be carrying 500 books in your pocket with only the weight of the USB Flash felt. Your Laptop or Smartphone can turn into an eBook Library that the biggest bookshop in the city cannot rival it. 5. Information in eBook is easy to search. With the aid of Find command, you can search for any information in a PDF eBook. It is easy to read eBook. 6. It is easy to sell. It can be marketed to millions of people over the internet. [Websites, Social Media and eMails] and is available 24 hours. Above are just 7 reasons out of the numerous reasons why eBook is becoming popular and why people now prefer it to physical or printed book. Because of these advantages and shift from physical book to eBook, Authors and Writers and eContent Developers [Like Magazines, Newsletters and Articles writers] are now publishing their works in an eBook format. The problem now is that, What Does It Takes To Publish An eBook? 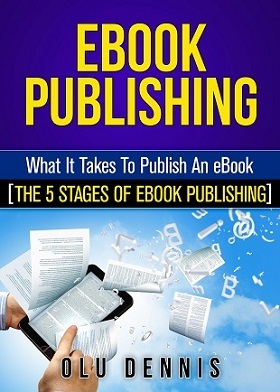 The single goal of this eBook is to tell you what it takes to publish an eBook and "The 5 Stages of eBook Publishing". This knowledge is to help you to be able to Self-Published your eBook by yourself. I am a Self-Published author, [I have published 7 eBooks on both Amazon.com and Smashwords.com], so you can be a Self-Published author too. The book is divided into 5 sections. Each section is to teach you each of the 5 stages of eBook Publishing. In a nutshell, this eBook is to teach you all what it takes to be a Self-Published author.